Moneyball, based on the non-fiction book by journalist Michael Lewis (The Blind Side), finds a new way to reinvent the David v. Goliath tale with a man who reinvented the business model of baseball. In 2001, the New York Yankees (team payroll: $125 million) have just knocked the Oakland As (team payroll: $41 million) out of the playoffs. Oakland General Manager Billy Beane (Brad Pitt) also has to suffer a summer where his biggest players leave the team to sign hefty free-agent contracts with bigger teams. He’s left with sizeable holes, a meager payroll, and the expectations to carry on winning. Beane is convinced that his group of paid scouts will be of no help. They’re men of an older era, sticking to the old ways of selecting talent (why the hell do these guys even calculate stuff like “good face” and “ugly girlfriend”?). Beane finds a kindred spirit in Peter Brand (Jonah Hill), a Yale grad with a degree in Economics. Brand’s mathematical data focuses on one all-important stat – on-base percentage. Without getting on base a player can’t score runs, and no runs make it hard to win a game. Brand and Beane calculate a series of players undervalued by other teams. Their more cost-efficient model for success becomes known as “moneyball.” Together they put together a team of castoffs and misfits to contend for a championship against teams that have three times the Oakland As’ payroll. Moneyball could be described as a baseball movie for people who don’t like baseball, but that’s a little too glib by half. It’s very much a sports film but it takes the underdog approach in a new, sleekly modernized manner. It’s about a guy bucking the traditional mode of thinking, the established order, and the chaffing and nay saying of those entrenched in the traditional, outmoded, establishment. There’s always something inherently entertaining about an innovator fighting the system and eventually being proven right after all the trials and tribulations. And with Pitt, a major movie star, giving a movie star-caliber performance, self-effacingly charming with a twinkle and a swagger, Moneyball just seems to fly by like a spirited caper. We’re watching a smooth operator work the room, playing other general managers off one another and secretly accruing his talent while duping his peers. At its best moments, Moneyball feels almost like a breathless con game. The intelligent, stats-heavy dialogue doesn’t stoop for much exposition. The stats and acronyms whiz by, with Social Network-style crispness thanks to Oscar-winning screenwriters Steven Zallian and Aaron Sorkin. It’s a pleasure listening to top actors savoring the smart dialogue. You just want to kick up your heels and relax like you’re watching a game at home, rooting for your team to pull out an unlikely coup. 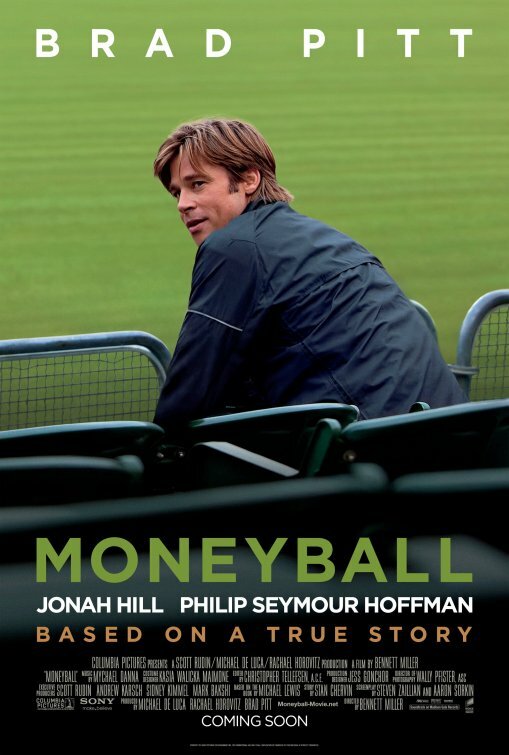 Moneyball plays best for baseball fans who won’t bat an eye at the stat-heavy chat. For non-fans of the game, well, you can watch Pitt spit chewing tobacco into a cup a lot. Beane chooses not to get to close to his players so that eventual roster cuts and trades will be all the easier without emotional involvement. The movie kind of follows suit. The characters are kept at a surprising distance. The movie seems practically ambivalent about people. 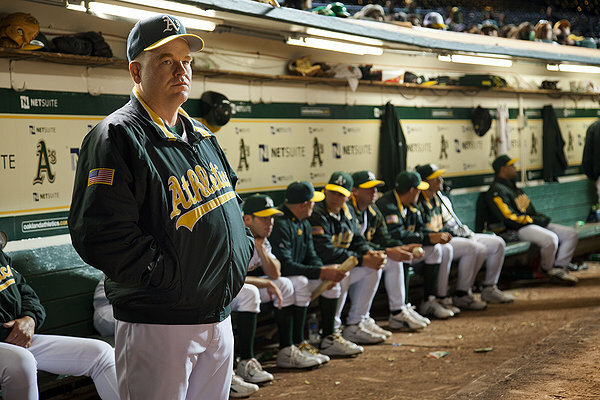 Moneyball seems to lack an emotional center; and people thought The Social Network was cold. Beane is given flashes of back-story about his flameout in the majors, which supposedly provides the guy a motivation to prove himself against his legion of detractors. But these flashes are not enough. Director Bennet Miller (his first film since 2005’s Capote) incorporates way too many scenes where we watch Beane driving, silently contemplating his life-changes. The feud between Beane and his curmudgeon manager, Art Howe (Phillip Seymour Hoffman with the unkindest of haircuts), never comes to a head. Howe is upset at the thankless job of corralling a team of misfits and cast-offs into a competitive team. But like many other conflicts, the movie ducks from finding a real purpose for its integration. Howe just seems to be another naysayer who shakes his head at Billy. Surely the relationship between GM and manager should be more complicated than as presented. The Beane family flashbacks and his scenes with his daughter (the adorable Kerris Dorsey) are attempts to further humanize a man who has abandoned the advice of people for spreadsheets. It’s easy to get caught up in the romanticism of the nation’s oldest sporting games, but Moneyball’s tone seems to toggle between reality and romanticism. For Beane, there are no small victories. Even success is deemed failure under the metrics of championship-or-nothing. “People only remember your last out,” he says despondently. So when the Oakland As fail to make a run into the playoffs (is a 2002 playoff series considered a spoiler?) the movie is left with a listless conclusion. Brand tries to prove to his boss the significance of what they have accomplished on their meager payroll, at one point winning a record 20 games in a row. But a winning streak of 20 games is not the same as a championship. Moneyball rightly proclaims the game of baseball as a rigged sport, where the divide between “haves” and “have nots” is vast. It is the only major league sport without a salary cap. The teams with the big pockets can afford the marquee talent. There’s a reason Lewis’ book has the subtitle “The Art of Winning and Unfair Game.” The implications of Beane’s accomplishments are unclear. His cost-efficient, stat-heavy approach was co-opted by the Boston Red Sox and turned into championships in 2004 and 2007. Is that a real vindication for Beane? It seems to me that the game’s issue of wealth disparity is still in full effect. Even if teams follow Bean’s approach, it still means that the bigger city, wealthier teams like the Red Sox or the Yankees can still outspend their competition. So it seems like to me that Bean’s moneyball approach simply meant that the focus changed on less costly talent. It did nothing to alter who could outbid their peers for the now-cheaper talent. It’s hard to squeeze a happy ending out of a story that concludes with the rich getting richer. The movie is pretty much a buddy comedy, granted Beane is a much more dominate personality. Pitt feels like he’s coasting on charisma, though the actor gives a greatly entertaining performance. It’s not so much nuanced but he’s enjoying himself. The man looks eerily to be aging into Robert Redford, which begs the question about the nature of time travel. Hill (Superbad, Get Him to the Greek) gives a surprisingly adept dramatic performance. The comedic actor seems subdued next to the charisma of Pitt, like the character is continually awed by Billy. The Oscar-talk for the comedian seems a tad premature. He’s good but just because Hill delivers a good dramatic performance does not mean people should automatically start fielding his name as an award contender. That’s like saying let’s give an award to Paris Hilton because she could remember her lines. It’s also fun watching actors like Chris Pratt (TV’s Parks and Recreation) portray players that are still recognizable. Moneyball says that baseball is not a game about heart, sweat, or the love of the game. It’s about numbers. That’s something of a cold message but Billy Beane is not one for false comforts. At its best, the film is a breezy caper with crisp dialogue and slick editing, but it’s also hamstrung by an inconsistent tone, a methodical pacing (133 minutes! ), and a dearth of strong characterization. Beane was destined to be a baseball star but it wasn’t to be. Baseball is the most mental of all national sports, and it’s hard to crack such an insular model of play. That’s why baseball movies resort so much to romantic staples about the lore of this game. This is not a romantic movie; it toys with romanticism but ultimately sides with the science and number crunching. The emotion seems to have been squeezed out of the story thanks to the statistics. 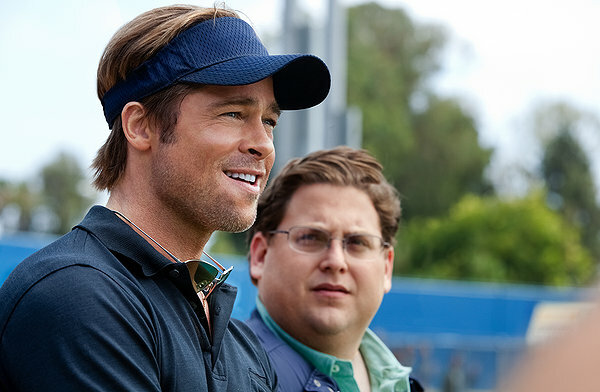 Moneyball is a baseball movie that fantasy baseball nerds have been waiting for. I’m not particularly a baseball fan (too slow), but I still found the movie to be a rewarding night out sans crackerjacks. Posted on September 25, 2011, in 2011 Movies and tagged aaron sorkin, basbeall, bennett miller, brad pitt, chris pratt, drama, jonah hill, oscar, phillip seymour hoffman, sports. Bookmark the permalink. Leave a comment.